Upper level condo. 4 miles to Rocky Mountain National Park. Planning an Estes Park Wedding? You can provide your Estes Park wedding guests with a Rocky Mountain vacation of their own by recommending Fall River Village's two bedroom, two bathroom condos. 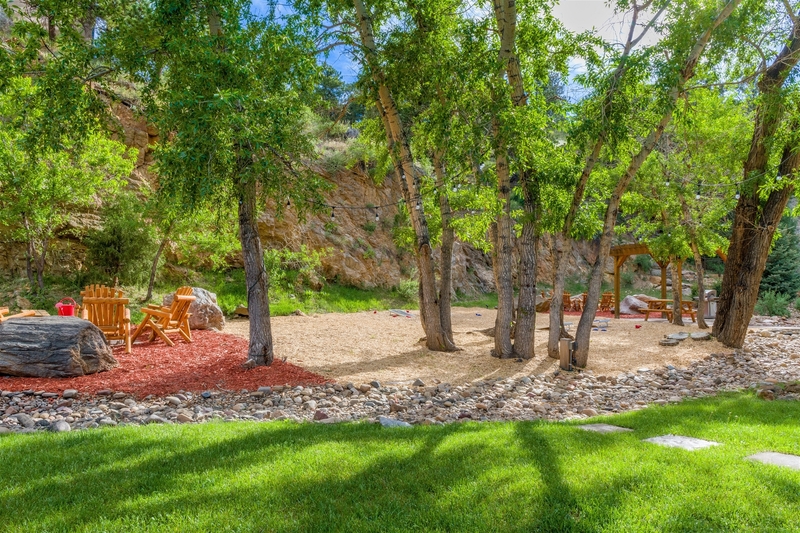 Centrally located just off of West Elkhorn, our modern condos make for a quiet luxury getaway with easy access to any Estes Park activity. With our condos' patio doors opening to Fall River, guests can hear the river from their bedrooms. Fly fishing is literally just steps away. Renowned hiking trails and rock climbing are a few minutes drive! Take a Riverwalk stroll and within 5 minutes guests can enjoy quaint shops and restaurants. Or they could ride the free shuttle through Estes Park and to Rocky Mountain National Park. 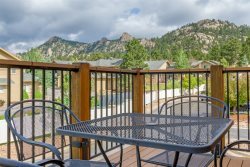 Each condo is equipped with two hair dryers, an iron, ironing board, clothes hangers, washer and dryer to help them prepare for your Estes Park wedding. Please feel free to give us a call to discuss booking your wedding party and how we can best accommodate your Rocky Mountain wedding! You can also click here to learn more about our policies. Community Room - 750 square feet of space with granite countertop, dark wood cabinets, stainless steel fridge/freezer, 55" & 32" LED Smart HD TVs, and a handicap accessible bathroom. The community room provides an indoor option to host about 35 people. Tables and chairs are available upon request for an additional fee. Rental price is $150 per hour, max of 5 hours per day. The Pergola - 88 square feet (8'x11') of outdoor space with a picnic table. There is a fire pit and two grills right next to the pergola. You can reserve this area for a family gathering of about 10-15 people. Rental price of $200 is for a block of 3 hours; $100 per hour for each additional hour up to a max of 5 hours. The Pool Deck - 484 square feet of outdoor space with a propane grill, two patio tables with umbrellas and 12 patio chairs total, a handicap accessible bathroom, and a hot tub. Rental price is $500 for a block of 2 hours. This area cannot be rented for longer than 2 hours per day. Fall River Village is a proud member of the Estes Park Wedding Association. Please click the image here for great wedding resources, qualified vendors and to start planning your destination wedding at our SkyView Event Center in Estes Park today!